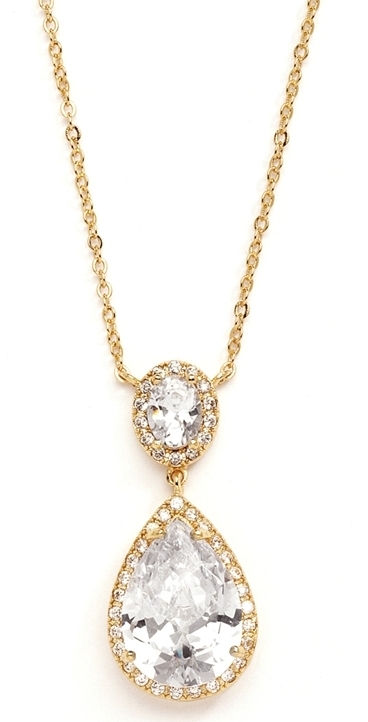 * Mariell's beautiful CZ bridal necklace boasts a pave framed oval with a brilliant pear-shaped drop. * This 14K Gold plated wedding necklace is adjustable 16" to 18" with a 1 1/2" h pendant. * This is our editor's top choice for brides & mothers of the bride! * Mariell's top-selling couture wholesale bridal necklace features a pave framed oval with a brilliant pear-shaped drop.